Oplismenus aemulus (R.Br.) Roem. & Schult. Leaves with ligule c. 3 mm long, membranous at the base, dividing into cilia; blade 4–18 mm wide, sprinkled with fine hairs, midrib very narrow, whitish on the lower surface, 10–15 fine nerves either side of it. Panicle racemose with secund racemes 3–5 cm long. Spikelets close together on the racemes, 2.5–3.5 mm long. Lower glume shorter than the spikelet, 5-nerved, awned from the apex, with a rather slender, flexuous awn over twice the length of the spikelet; upper a little longer and broader, 7-nerved, awned from behind the acute apex with an awn 0.1–1 mm long. 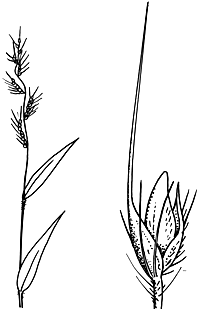 Lower lemma the length of the spikelet, 7-nerved. Upper lemma c. 2.6 mm long, obscurely 7-nerved. Palea shorter, margins infolded and embracing the flower, 1.2 mm long. Distribution and occurrence: Usually grows in gullies and shaded forest.